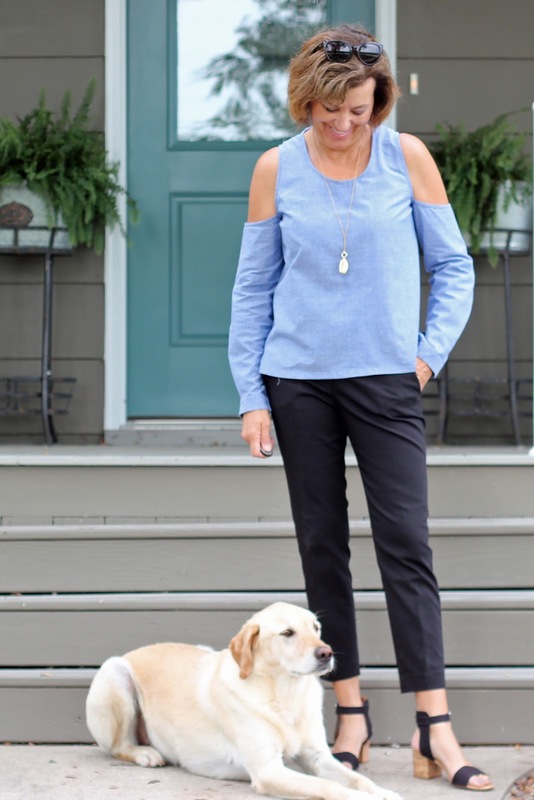 What can I say about the cold shoulder look? Maybe I am totally in love with it and keep making top after top! 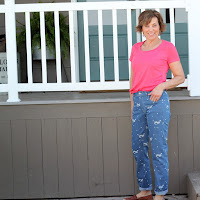 I had purchased Mood Fabrics’ Steven Alan Denim Blue Cotton Chambray in March with the intentions of a Scout Tee and maybe an Archer but plans change! 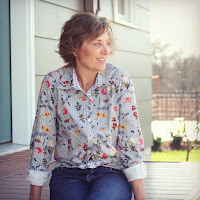 I am sorry to say this particular chambray is sold out but no worries, Mood Fabrics’ has a great selection of Chambray, in prints and solids in several colorways. 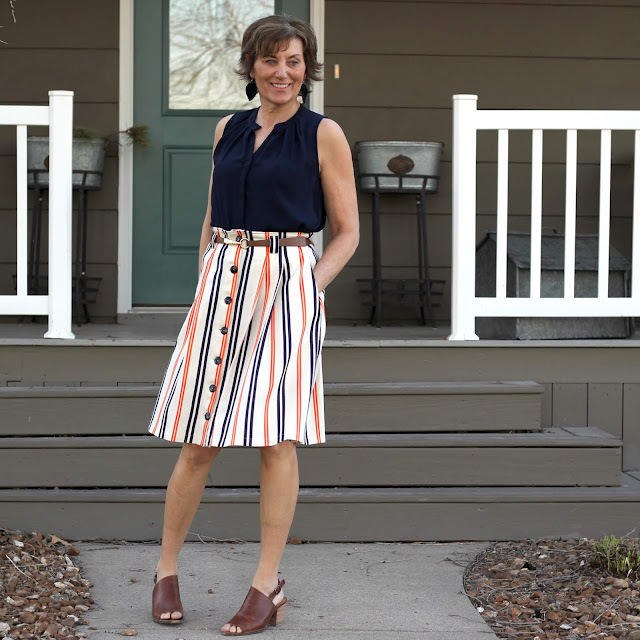 I used McCall’s 7510 in View B, which I thought might be a good look for early fall. My area will still have some 80 degree days with cooler nights and this will be fun to wear now and in early fall. 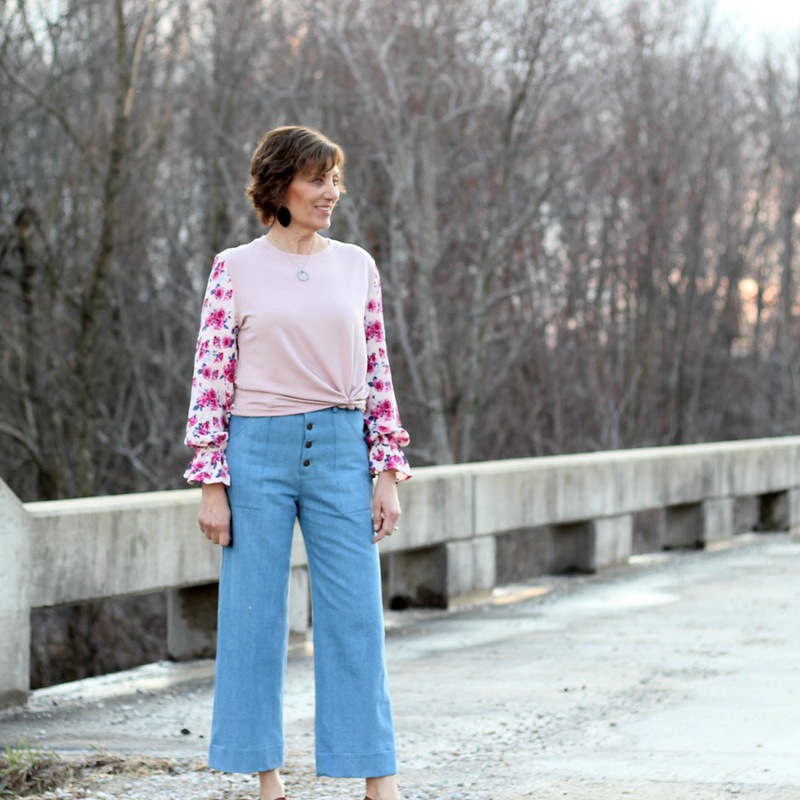 My hubby was in the yard when I was taking pictures and commented that he really liked this outfit but were the sleeves to far down on my arms. A valid question but when you look at the drawing on the McCall’s website it looks about like my garment. This Chambray is incredible and I love working with it. I did mark the wrong side on each piece, sometimes it is hard to tell. 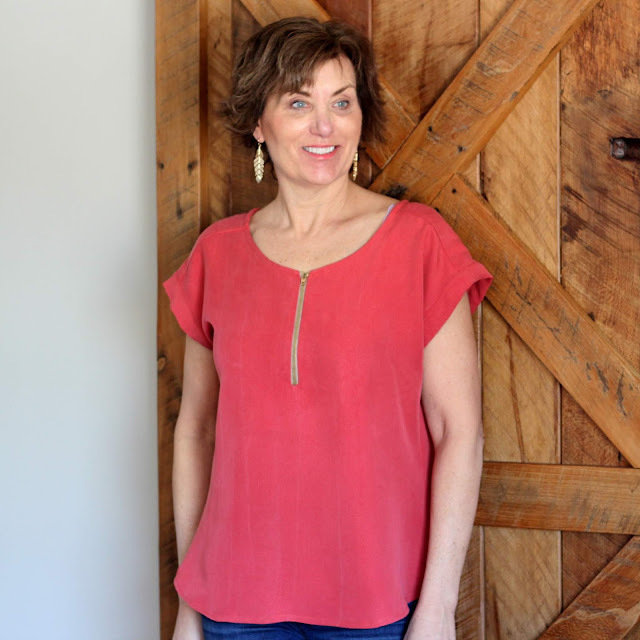 The Chambray pressed beautifully which made it is easy to make this blouse. McCall’s instructions call for a lining but I did not do that. Instead I used bias binding for the shoulders and the neckline. The pattern does have a keyhole opening in the back. I basted this closed and was able to get the blouse on without a problem. Truthfully, it is a bit hard to get off but that is okay, I prefer no keyhole opening. I did add one inch to the sleeve length but after the blouse was completed, this really wasn’t a necessary adjustment. I do notice in the photos a few wrinkles in the front right where the sleeve attaches. I don’t think that is the fit of the blouse but the weight of the sleeves pulling on the front. Does that make sense? My thoughts… this is a lot of sleeve, attached to very little of the front and back. It seems to be a stress point. 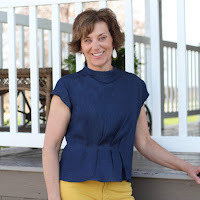 I have made this top before using the flutter sleeve and a incredible Mood Fabrics’ Italian Twill (blog post here). 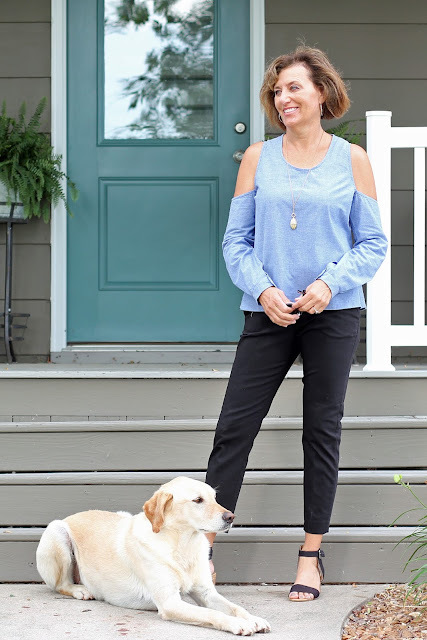 That top is probably my favorite cold shoulder top. 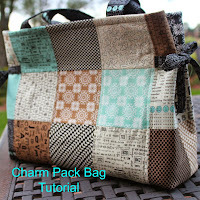 The pattern and fabric are an incredible combination. Also, I do not notice the wrinkles on the short sleeve one. I really do like my new top and the cold shoulders are fun to wear. I figure all the yoga I do, I should show off those shoulders! Now a couple of shots with Junior and a trick he can do! 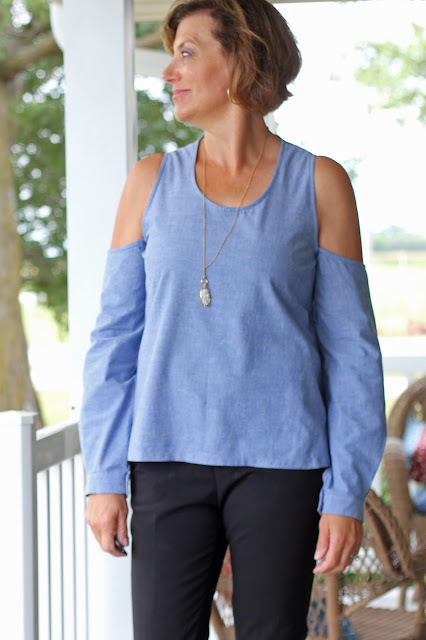 What about you, have you made the cold shoulder look? 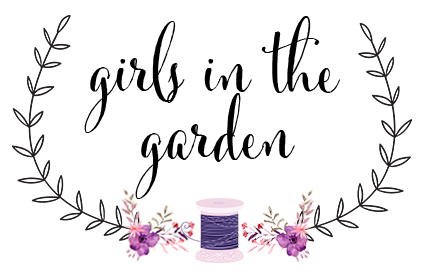 What have been your favorite fabrics? 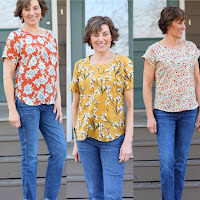 I have made one or two cold shoulder tops and really enjoy them. Whether my shoulders are as toned as your 'yoga' ones is another matter :) This chambray top looks great on you and the fabric sounds divine to sew and press. Thanks, and I love the cold shoulder it looks and keeps us looking good! 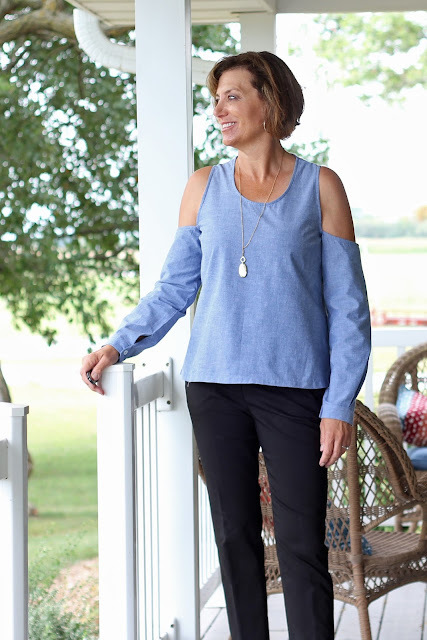 I personally don't like the 'cold shoulder' look, but it does look wonderful on you! Thanks, it took some time to grow on me but know I love it. Your creativity is just amazing. Post after post you keep coming up with beautiful things. I've not gotten on the cold shoulder bandwagon but that's okay - I'm on enough other bandwagons!